411 Freebies And More: GNC On-The-Go Blender Deluxe $26! GNC On-The-Go Blender Deluxe $26! 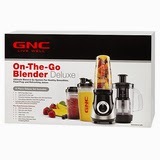 The GNC On-The-Go Blender Deluxe drops from $69.99 to $25.99 at GNC. Add $2.99 for shipping. This is the best price we could find for this 300 watt blender by $28. It comes with 5 BPA free cups (two 28oz cups, two 20oz cups, one 10oz cup), 2 to-go lids, 2 stay-fresh lids, 2 flat lids with straws and a 28oz juicer attachment. A Red Version is also available and sales tax is charged in most states.